Poor Crystal Cox has a problem. She used the internet to smear people she perceived as doing wrong. (I have yet to find any actual evidence of wrongdoing, but apparently Crystal thinks if she yells long enough and loud enough, someone will believe her.) Now the internet is fighting back, and shining a light on her shenanigans, and Crystal is none too happy about it. The original story is about Kevin D. Padrick and Obsidian Finance, who won a $2.5 million judgment against Crystal for her defamation of them. A jury determined that Cox indeed defamed Attorney Padrick and Obsidian Finance, and held her responsible to the tune of $2.5 million. The verdict made headlines because the judge in the original case said that Crystal Cox was not a journalist, and therefore should not be afforded journalistic protections (under Oregon’s shield law). That meant she wasn’t entitled to keep secret an “anonymous source” she says provided her the information upon which she relied when she (untruthfully) called Mr. Padrick a thug and a thief, and said he was committing tax fraud, among other things. Bloggers initially set out to discuss this particular portion of the case, wondering if it might have future negative impacts on bloggers. 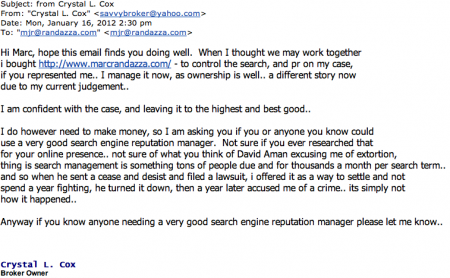 Then the story turned to Crystal Cox herself, who registered the domain name marcrandazza.com to smear a lawyer she begged to help her, then decided not to use. She registered Marc’s wife’s name (jenniferrandazza.com), and then Cox registered Marc’s three year old daughter (nataliarandazza.com). The implication was clear: pay me into infinity and I will remove what I posted about you. The motive is certainly with actual malice, certainly is defaming, paints me in False Light, is misleading to the masses in major media publications, violates my rights to privacy, accuses me of a crime, endangers my life, incites a riot against me and puts me under huge duress for no reason as THEY had already WON their Case, and I was not on Trial for that ONE EMAIL in any way. Nor had I been charged with a Crime. Letting others read Crystal’s own words is defamatory to her? Interesting. And now Kashmir Hill of Forbes, David Carr of the New York Times, Marc Randazza, Kenneth P. White of Popehat.com, Tracy Coenen, Randazza Legal Group, have launched a campaign to set up a Blogger for Extortion when I was not accused of Extortion in an Criminal Complaint, nor was I on trial for extortion and now this Lynch Mob has put me under Extreme Duress and ALL will be named in my Federal Hate Crime Filing, Criminal Complaint, Judicial Complaint, FBI Complaint, Attorney General Complaint, Bar Complaint and Department of Justice Complaint. I now face daily threats, constant online attacks, and even have a Federal Judge Accusing me of a Crime that I did not Commit, and without a Public Defender which I asked for and without due process to present my side of said email and allegations. 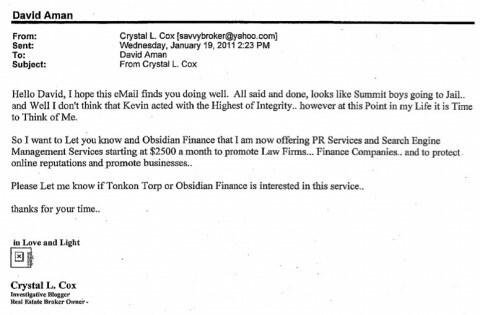 All because of One Email David Aman, Tonkon Torp Lawyer used to attempt to set up a Blogger that was Exposing alleged corruption he and his law firm Tonkon Torp LLP was involved in. I plan to sue David Aman Personally and Professional. 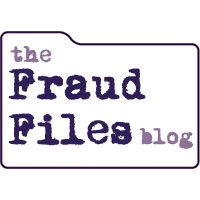 I also Plan to include this Malicious Attack in my Federal Hate Crime Filing, Criminal Complaint, Judicial Complaint, FBI Complaint, Attorney General Complaint, Bar Complaint and Department of Justice Complaint as Soon as I have the time to file it. Let me get this straight. Crystal L. Cox believes that she should be able to say whatever she wants about anyone – – true or not (mostly not) – – without any consequences. But when the light is shined on her – – using Crystal’s own words – – that’s not okay. When Crystal’s actions are exposed, and the truth is brought to light about this “investigative blogger”… this is harassment. When the power of the internet is used by Crystal to spread lies about others, that’s okay. When the power of the internet is used to spread the truth about Crystal, that is not okay. In all fairness, Crystal is outclassed in both intellect and sanity. One wonders if she has any family or friends? Certainly someone – – even an acquaintance – – watching this would see the crazy in action and advise Crystal to step away from the computer. a. to wrest or wring (money, information, etc.) from a person by violence, intimidation, or abuse of authority; obtain by force, torture, threat, or the like. b.to take illegally by reason of one’s office. Based on these definitions, does Crystal Cox’s attempt to get money from the very same people she attacked under the guise of “reputation management” constitute extortion? You decide. This Cox lady is definitely not right in the head. She needs a new career. Needs a “new” career? As if she has one or has ever had one? LOL!